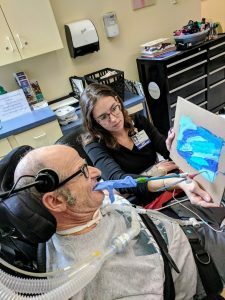 A Magee outpatient uses a mouth stick and paintbrush to make art, with art therapist Alexandra Shaikh. 2018 was a busy year for the Art Therapy Program at Magee. Not only did patients enjoy spending time in the art studio at the main hospital, but the Riverfront outpatient facility gained its very own art studio space as well. The Riverfront’s art therapy studio provides patients the opportunity to create in a dedicated space that strengthens the creative process. Within the outpatient center’s open studio model, patients choose the amount of time they’d like to make art with the Art Therapist’s guidance. This is another way to support the inpatient to outpatient transition and provide continuity of care. With the completed art therapy studio, participation doubled over six months. Community outreach and engagement grew in 2018. The Philadelphia Museum of Art’s Bridges program gave patients the opportunity to engage with art and cultural experiences throughout the year. We know that art heals, and the Bridges program highlights the impact that art has on our health and well-being. 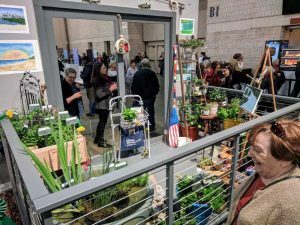 In early March, outpatients in the Day Hospital program contributed artwork displayed in the Philadelphia Flower Show in collaboration with the Radnor Middle School’s Watershed program. The display reflected a beautiful therapeutic healing garden for people of all abilities to engage in creative arts therapies! Proud display of artwork created by Magee patients at the 2018 Philadelphia Flower Show, that reflects a healing garden for people of all abilities. Dr. James George’s painting was awarded at the Expressions and Impressions art exhibit and is now on display at Magee on the second floor. Magee artists were asked to participate in an art exhibit at Villanova University titled, “Expressions and Impressions: Artists Living with Disabilities.” The gallery showcased more than 100 works of art by people with disabilities in the surrounding area. Highlighted during the evening was an award for Magee’s own former patient and art therapy supporter Dr. James George. In December, Magee patients and staff were invited by Universal Pictures to a private screening of the feature film, Welcome to Marwen, from acclaimed director Robert Zemeckis and starring Steve Carell. Based on the true story of Mark Hogancamp, the film intersects physical and cognitive rehabilitation with art making. The audience connected with the powerful message of resilience in the human spirit and that “Art Heals.” Every day, Magee’s Art Therapy program allows people to create bold expressions of artwork that reflects that same meaning. 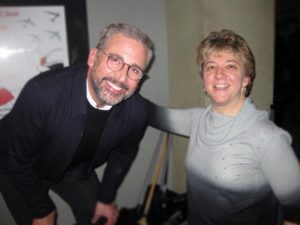 Magee outpatient meets Welcome to Marwen star Steve Carell after a private screening in Philadelphia. At the main hospital, patients were busy making art during open studio sessions, individual sessions, and sometimes during other therapies. 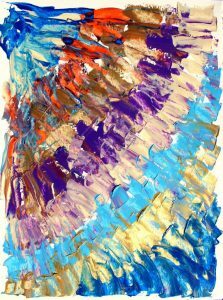 Many patients participated in the Art Therapy program’s Look UP! 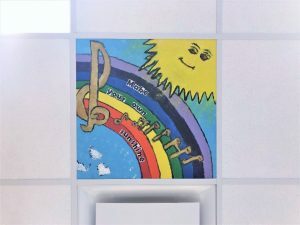 Project, painting ceiling tiles to be viewed by patients while laying on mats in the therapy gym, during weight shifts in the art studio, and even while laying down in their rooms. 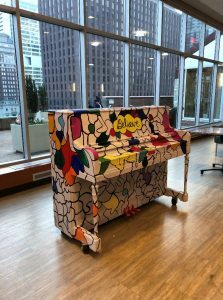 Art and Music Therapies teamed up to up-cycle an old piano by hosting several “Piano Painting Parties” where patients and their families added color to the piano and also participated in sing-a-long jam sessions led by music therapist John Glaubitz. The piano now lives in the 6th floor atrium for all to enjoy – visually and musically. The annual Art Heals fundraiser was the highest attended yet with 150 donors, former patients, artists, families, and Magee staff who helped raise necessary funds for the program to continue growing! Throughout the year, 486 patients participated in Art Therapy during 3,140 Art Therapy sessions. Most participants created multiple pieces of art work. For over a decade, art therapy at Magee has supported the emotional, mental, physical and spiritual aspects of well-being. In the coming year, we will keep providing services to increase quality of life and reach more people through the healing power of art. To learn more about the Art Therapy Program at Magee, click here.